If during the Earth Pig Year of 2019, the Rat, Ox, Monkey and Dragon natives saved plenty of money, in 2020 they will need to be careful and avoid any possible theft or accidents. The Rat, Ox, Monkey and Dragon natives should not fall prey to jealousy. Arguments may occur, especially in April and November. Marriage or starting a new relationship in February, July, September, November and January of 2020 are not recommended for neither of these 3 chinese zodiac signs. If they want healthy and functional relationships, the Rat, Ox, Monkey and Dragon natives might need to make some compromises, without being so stubborn all the time. With patience, they can easily overcome any possible misunderstandings. In 2020, the Rat, Ox, Monkey and Dragon natives should guard their money and wealth. It would be best not to venture into new businesses, but to continue the projects already initiated during 2019. Vigilance is advisable during July. 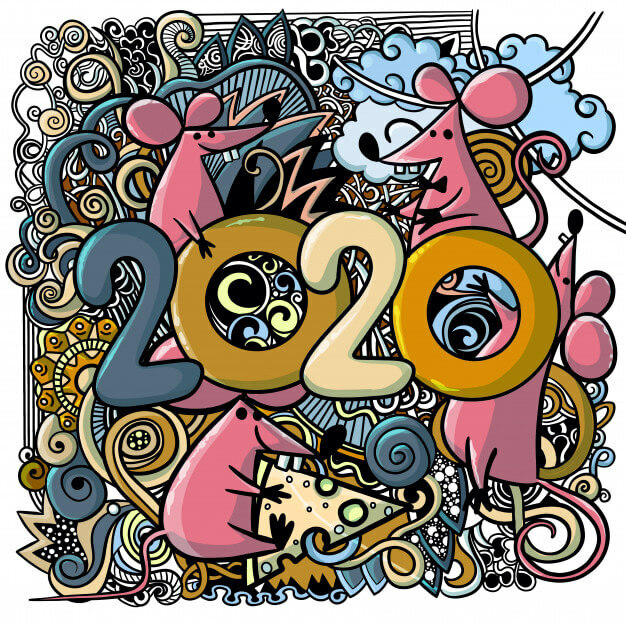 They sometimes tend to exaggerate and make a lot of plans, but during the Year of the Rat 2020, it would be best to be as realistic as possible. Bad luck may occur during February and November. May comes with better perspectives that might increase their profits. The Rat, Ox, Monkey and Dragon natives can track the market and make business plans, which they can launch during the Metal Rat Year . Those born under the Rat, Ox and Dragon signs will enjoy a stable health, but they should be on their guard against any possible accidents caused by metallic objects. They will meet mentors willing to help them and they will encounter many opportunities. They will have the power to focus and to make things happen and also, the strength to overcome any possible obstacles. After the trying times of 2019, the Tiger, Pig, Rooster and Snake zodiac signs will enjoy harmony and balance in 2020. The best months of the year: March, May, July, December. The worst month of the year: February, June, August, November. Your relationships will have ups and downs and jealousy behavior might occur. Because of this, the Tiger, Pig, Rooster and Snake natives might be either unfaithful, or they can enjoy a peaceful home, full of happiness and understanding. Their relationships require special attention. They need to spend more time with their loved one, romantic vacations are highly recommended. If they wish to get married, the best months are March and December. They should avoid getting involved into sexual scandals, especially in October. The Tiger, Pig, Rooster and Snake natives are natural leaders. Their business sense is at its peak in May. It is not recommended to borrow or lend money in June. They count only on their own strength and they are success oriented people. The Metal Rat Year is a good year for investment, but they should rely only on themselves, because they will not encounter too many people willing to help them. They will earn money from businesses where competition might get involved. They should not be greedy. It is better if they can pick just one from the many opportunities they have, without allowing others to distract them from their plans. The vital life force is very weak throughout 2020. Health should be a main concern. The Tiger, Pig, Rooster and Snake natives should be careful about their thoughts and about the food they eat. They need to spend more time in the middle of nature and, in particular, in places with a lot of water. With a lot of effort, the Tiger, Pig, Rooster and Snake natives will overcome any possible obstacles and they will confidently walk towards wealth, prosperity and success. The star of love and the star of success in exams will be on their side. In 2020, the Rabbit, Goat, Horse and Dog signs are under the influence of the positive energy emitted by the prosperity star, these sign being considered the luckiest ones of the year. Throughout the whole year, the Rabbit, Goat, Horse and Dog natives will go from agony to ecstasy. The times of peace and harmony will be followed in quick succession by periods when their relationships are weakened, undermined by betrayal and ploys. It is advisable to focus on everything related to romance and to avoid treating in a superficial manner the relationship with their partner. Quarrels may occur out of lack of confidence in their own strength or because of possible temptations or infidelities, especially in April and January of 2020. Yet, it is a good year for marriage and a good year to conceive a child. Business will generate secure income, but it is recommended to pay great attention when signing contracts. Despite their diplomacy, the Rabbit, Goat, Horse and Dog natives are not going to find too many people willing to help them in 2020. They will earn money on their own. Unfortunately, they will also attract gossip and betrayal. The Rabbit, Goat, Horse and Dog natives are going to attract plenty of opportunities, but they need to be extremely alert in order not to lose them. They need to count on very well established plans and to set realistic goals. They need to establish some goals that are easier to reach, without asking the impossible, otherwise money and opportunities will slip from their grasp. In 2020, the Rabbit, Goat, Horse and Dog natives will enjoy an amazing health, but they can weaken it if they get too preoccupied about earning money. Money will come easily in they accounts and pockets, as long as they are not greedy! Lending money is not recommended. They need to maintain a pure and honest heart and their spiritual force will win all battles.